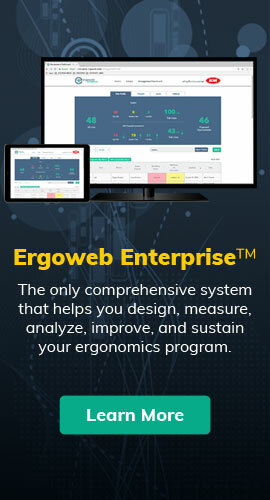 Note: Ergoweb often gets questions related to the pros and cons of sit-stand workstations, and it’s our practice to ground our opinions and recommendations in research whenever possible. In that spirit, we recently checked our The Ergonomics Report™ Archives and found this applicable study review from 2010. German researchers investigated the effects of seated work vs. a mix of seated and standing work on physical and psychological complaints and on data entry performance. The researchers randomly assigned 60 male non-touch typist university students, aged 18-35 years, to either an intervention (mix of sit and stand postures) or a control group (sitting postures only). Those with disease history were excluded from the study. The office work was simulated for four hour work periods from 8:30 am to 12:30 pm for five consecutive days. The sitting control group performed data-entry tasks for 45 minutes of each hour, other tasks (e.g., photocopying, paper shredding, faxing) for 10 minutes, and a 5 minute break. The sit-stand intervention group performed data entry while sitting for 30 minutes each hour, 15 minutes while standing, 10 minutes other tasks, and 5 minutes of break. The researchers used a Gießener Beschwerdebogen (GBB) questionnaire to measure physical (musculoskeletal) complaints and a Mehrdimensionaler Befindlichkeitsfragebogen (MDBF) questionnaire to measure psychological (mood) complaints. They also measured the quantity and quality of entered characters in the data entry task as a measure of performance. The results of this study pair well with the results described in last week’s The Ergonomics Report™ article, The Effects of Walking and Cycling Computer Workstations on Keyboard and Mouse Performance, were researchers found little or no performance differences between sitting and standing computer performance, but did see significant performance decrements when walking on a treadmill or riding a stationary bicycle. It’s always best for ergonomists to make evidence based recommendations, and it’s also wise that we understand the impact of our recommendations on performance, as well as health and safety. This study is one piece of evidence we can apply when making recommendations for dynamic/active computer workstations, a growing workplace trend. Even for high pressure data entry tasks like those applied in this study, the effects of standing on performance were small and not statistically significant, but the effects on musculoskeletal comfort and mood were significant and positive. All male, university students as subjects. Would the findings apply beyond this group? The subjects were inexperienced data entry typists, which created a learning effect over the course of the experiment, possibly skewing the performance results. A short, laboratory based intervention period, only 4 hrs/day, for only 1 week. Would real working conditions over longer periods of time change the outcomes? A single condition of changing postures from 30 minutes of sitting to 15 minutes of standing. Would other rotation schedules change the outcomes? The experiment was not blind, meaning subjects could have been influenced if subjects behaved as they presumed the researchers expected. Husemann, Britta; Von Mach, Carolin Yvonne; Borsotto, Daniel; Zepf, Kirsten Isabel; Scharnbacher, Jutta, Human Factors: The Journal of the Human Factors and Ergonomics Society, Volume 51, Number 3, June 2009, pp. 310-320(11). This article is republished, with permission, from The Ergonomics Report™ Archives, where it originally appeared on October 11, 2010.